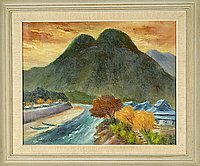 Autumnal landscape of river and mountain. 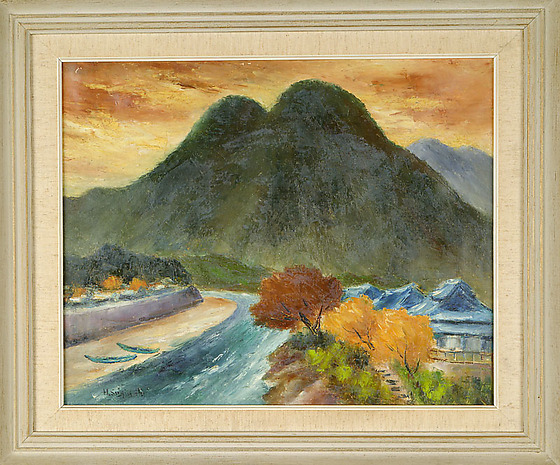 A large dark green mountain under a reddish yellow sky towers over a bluish river that rushes around a bend mid left foreground. Two boats sit on the shore outside of the walled town in left foreground. Trees in autumnal colors grow among green shrubs on the right bank. A stepped path leads to fenced blue roofed houses in right foreground.